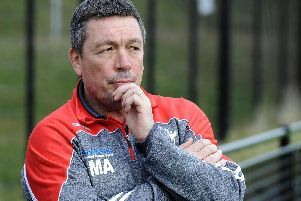 Mark Aston has challenged his Sheffield Eagles players to turn recent signs of recovery into a sustained run of results, starting with tomorrow’s trip to Swinton (4.30pm) where a familiar face lies in wait. Aston wants two wins from the next three as he looks to convert improved recent showings into priceless Championship points. Bottom club Swinton are first on the menu, but Aston is expecting a tough encounter after the Lions recently added Salford ace Levy Nzoungou, whilst also extending the loan of teammate Gavin Bennion. Last month they also added former Eagle Will Hope, who could face them for the first time since his departure. “We are really targeting winning at least two out of the next three games. We need to but it isn’t going to be easy,” Aston told The Star. “Swinton is up first and they have brought in a couple of loans from Salford, they are good players. They have Will Hope who we know well, they have decent players like Bracek, Thornley and many others. It will be tough. The Eagles are without the suspended Josh Toole, while Aston hopes to have Matty Costello, Jack Ashworth and James Bentley available from St Helens. Aston has been buoyed with spells of good play in the recent games against Barrow and Batley, whilst he got the full performance he was looking for in the win over Rochdale – now he says is the time to convert performances into points: “I was disappointed how they Batley game worked out because we gave it away,” he added.